It appears that Thai and Cambodian troops are preparing to withdraw from the disputed border area around Preah Vihear, with the border crossing to be open as early as this weekend! 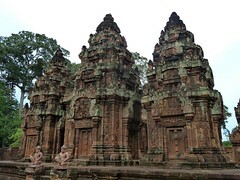 Alison in Cambodia has just started a new page on her blog tracking archaeological projects in Cambodia. Check it out here.